A fortnight ago I had written about the ‘equivalence commission’. It is now back in the limelight, even before the earlier controversy had died. The previous commission formed in 2016, after the MoD issued a controversial letter degrading military officers’ rank structure, was tasked to establish equivalence between them and the civil cadre. The commission had internal disagreements, with the military representative refusing to sign, as also the additional secretary heading the commission being moved out of the ministry. A recent press release by the MoD stated that the defence minister was re-establishing another commission on the same issue. Legally, the first commission itself was wrong in precedence. It was headed by an Additional Secretary, who stands twenty fifth in the Warrant of Precedence (WoP) issued by the Home Ministry and had as a member a Lieutenant General, who is twenty fourth in the WoP and hence senior. Was it an intentional action by the MoD to insult the armed forces? Why was it accepted by the military? There are no answers and no clarifications. The armed forces have suffered a series of deprivations in recent times but being disciplined services maintained silence. Entitled rations, wrongly termed as free rations, were withdrawn for officers in peace stations and a meagre allowance granted in lieu, which service HQs are struggling to enhance. Furlough of two months, a facility meant to be taken in emergencies, has also been withdrawn, while in every other organisation leave without pay can be taken for upto six months. The Prime Minister spends Diwali with soldiers in Gurez, addresses them, stating that armed forces members are a part of his family and the most respected community in the country, while the defence minister spends the same festival with troops in the Andamans. Simultaneously the government seeks to degrade its stature. Does one deprive and degrade one’s own family? Such an irony is only possible due to three reasons. Firstly, the government seeks to befool the soldier, who has no voice yet performs all assigned tasks without so much as a whimper. Secondly, visits to troops by the political hierarchy is only a photoop meant for forthcoming elections, to garner serving and veteran votes. Thirdly, despite all claims, they have no control over their own government which is run by the bureaucracy while they remain just figureheads. The battle for Non-Functional Upgradation (NFU) continues in court, with the government desperately seeking measures to delay and blunt its release, solely for the military. The Reddy commission, appointed to resolve OROP issues, had submitted its report to the finance minister over a year ago, yet it continues to gather dust, neither being released nor implemented. There are some issues which the defence minister must ponder over, prior to reconsidering ordering another commission. Is there any reason to order an equivalence commission, as a Warrant of Precedence already exists? Is the MoD above the government of India that it requires a separate WoP? Are the armed forces incapable of correct decision making, even on military matters, that they require approvals of junior non-military cadre? The approach of the defence minister appears to be the opposite of what it should be. She should be seeking to amalgamate service HQs with the MoD, establishing a joint and more cohesive organisation, rather than diluting one to enhance powers of the other. She should be aiming to induct more serving officers into the MoD to improve decision making, rather than enhancing existing trust deficit. If this equivalence exercise is intended to induct junior non-military officials into service HQs in place of senior uniformed vacancies, due to additional promotions granted to them, then the harm caused would be much more. The defence minister has neither justified her decision, nor is she likely to. The NFU battle, now in its final stages was launched not by service HQs for the welfare of its own, but by an individual who felt that the uniformed had been unjustly treated. It was accepted by the Armed Forces Tribunal (AFT), whose decision the government chose to contest in the Supreme Court. The government even instructed the army’s Judge Advocate Branch (JAG), to depute its officers in uniform to support government counsel in the Supreme Court opposing the case, possibly aiming to convey that even the military is against it. The ploy failed, compelling the government to seek alternate options. This while calling soldiers the most respected community, the government battles them in courts, solely to deny them their due, whether it is war-wounded disabilities, OROP or NFU. 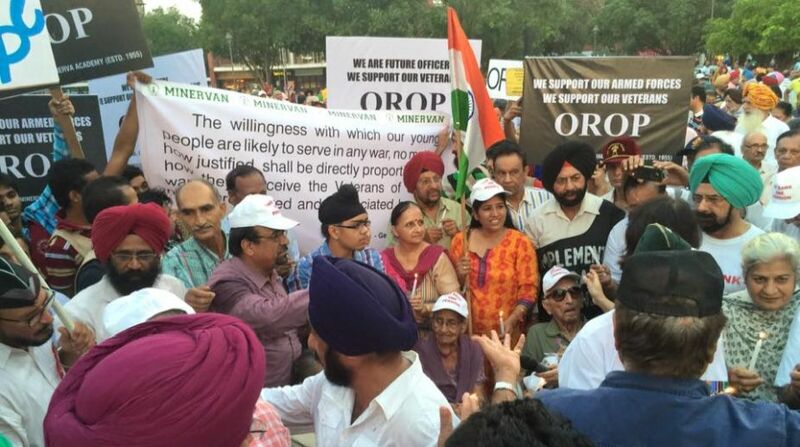 It ignores veterans battling for their rights by protesting for almost a thousand days now for the grant of a fair OROP and has them forcibly removed from Jantar Mantar. It fails to realize that a soldier retires between 35-40, as against other central services, who retire at 60. Hence with shorter service, his pensions would be lower, thus making OROP essential. While the bureaucracy may be least bothered, the political leaders should be aware that depriving the military of its rights is impacting morale. Social media is abuzz with comments and complaints on the government’s action, at times even against the military’s senior hierarchy, but there seems to be no impact. The government is duty-bound to protect those who risk their lives daily for national security, which it is shirking knowing the military lacks a voice. A gag order has been placed on the media – these contentious issues and even the veterans’ rally over the weekend was neither covered nor discussed. The veterans’ community, the sole voice of the soldier, stands by him in this battle. They will continue raising their voice, employing every media including social, to inform the nation of the damage being caused to the soldier and his morale by the government. Impact is being felt and concerned citizens have begun raising their voice. The government must act now.